ISLAMABAD: Azeem Begum, a PhD candidate in Karachi University (KU), has been very nervous while preparing to present her thesis in a conference in front of a diverse audience, comprising of professors and some students. Only the thought of presenting her thesis, on which she has worked for years, sent a chill to her backbone. “Ma’am please send him out because his presence is making me nervous and unable to present the paper to you properly,” Azeema requested her supervisor, Assistant Professor Dr Noreen Mujahid, who was helping her prepare for her big day. “No, he will stay and how will you present in front of other professors when you are unable to present in front of your class fellows. Please muster some more courage and confidence. You know everything, you can do it,” consoled Dr Noreen. It is nightmarish for an average new student, even of a private university, to prepare and give presentations. But over the period of time, and with the progressing semesters, students generally overcome the shyness factor. The content of the presentation also improves with the passage of time but that also depends on students’ efforts. Students are given a certain topic or an issue related to the subject by teachers, sometimes individually and sometimes in groups, for presentations, which is mostly graded. But a good presentation doesn’t only ends up in good marks for that particular assignment but also builds a good impression of the student on teachers, which culminates in good grades. Students develop skills and overcome the fear that helps them communicate their point of view properly. This turns out to be a very important aspect of their professional careers. But Azeema has also worked diligently over the years and three of her research papers have also been published so far, however, a presentation has not been her strength. But Azeema is not alone and most of the students suffer from this paranoia of presentations even at this level at the Karachi University. The last time Azeema presented on a multi-media projector happened three years back, when she presented at a computer lab, during research methodology class. Even then, the then Department of Economics Chairman Dr Abdul Waheed didn’t think students needed to come in front to present their dummy research papers. They can do it from where they are sitting. The computer lab has been fortified with a strong iron sliding door. Previously, it only had a wooden door. The lab is locked soon after class is over but pilferage happens every now and then. Dr Noreen added that students at Karachi University have potential, ideas and talent, but the disadvantage they have is a lack of confidence and courage to demonstrate their ideas. 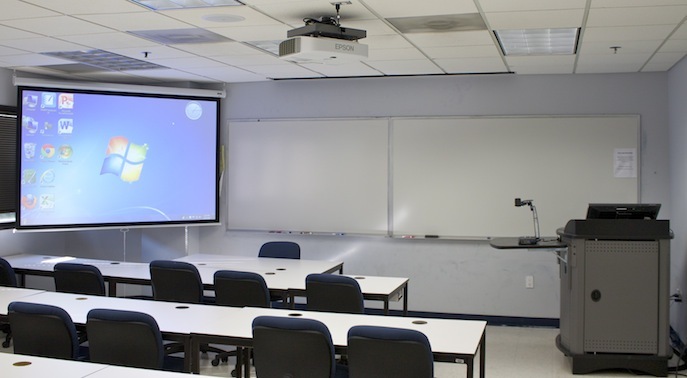 “This facility of multi-media projectors will enhance not only their presentation skills and writing skills but would also boost their confidence to face the world. It will motivate them to realise their own talents,” she said. According to the assistant professor, the reason that even a known educational institution like Karachi University lacks such a facility in this age and time is due to lack of funds and no proper security for equipment, coupled with a lack of ownership. “We are not sincere to the place where we spend 80 per cent of our lives,” she lamented. “In a random one and a half hour class, almost 40 per cent of the time I spend writing on a white-board with an erasable marker,” a Federal Urdu University (FUU) teacher said requesting anonymity. He added that when he uses a projector for teaching purpose, he generally completes the course well within time, giving good insights to his students. “Our department in-charge has brought his own projector for the purpose of teaching. Sometimes I take it from him and use it for teaching my students. It is very helpful. I can show diagrams and pictures to students, which is sometimes impossible to do without a projector. If it’s possible to construct those diagrams then it is an arduous and time-consuming task,” he added. He also said that a proper working projector could be purchased for a mere Rs10,000. However, there also has to be a computer in the class so that a teacher can teach on multimedia and students can give presentations. The overall estimate for equipping a class with multimedia projectors cannot be more than Rs25,000. When Higher Education Commission (HEC) Spokesperson Aisha Ikram was questioned that universities don’t have multimedia projectors at Masters, MPhil and even at PhD levels, she said that nowadays even bachelor classes have multi-media projectors. “You need to confirm whether your source was telling you the truth,” she advised. However, when she was told that it has been confirmed, she then said that it was not HEC’s domain to instruct micro-management things to universities. “Don’t compare private universities with government universities. Our universities have enough classes, with multimedia projectors as much as they are needed,” she said. “HEC gives policies, guidelines and also a lot of development funds to universities. If they don’t have a bulb or some other thing and it is not functioning, then it is their problem and they must address it,” she said. However, when she was told about KU and FUU, she said that the question should be asked to the relevant university officials. Federal Urdu University International Relations Assistant Professor Faisal Javaid said that HEC only gives enough funds through which salaries or other running expenses can be met. “There’s no fund or restriction from HEC to establish model classrooms. There are no microphones or multimedia projectors anywhere in Urdu University,” he said. However, he also criticised university management for not developing classes in the university. “HEC should be blamed along with the university for this. They are equally responsible,” he said and added that the classes need to be well-equipped and teachers and students should have such equipment that could prove helpful for them to teach and study respectively.